Dr. Durval de Noronha Goyos Jr. is member of the Brazilian and Portuguese Bar Associations and he is also admitted in England and Wales as a solicitor. He graduated from Wm. Hall High School, in West Hartford, Connecticut, USA, in 1969 as an AFS scholar to join the law school of the Catholic University in São Paulo, Brazil, graduating in January of 1975, followed by post-graduate courses, including a programme on Constitutional Law, at Hastings College of Law (University of California), in San Francisco, USA and revalidation of diploma at the University of Lisbon, Portugal. 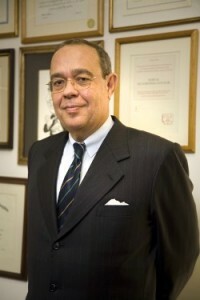 Dr. Noronha was an “ad-hoc” Brazilian government representative for the Uruguay Round of the GATT in 1992 and 1993 and the President of the Brazilian Bar’s commission on the GATT. Dr. Noronha is an arbitrator for the World Trade Organisation (WTO), based in Geneva, Switzerland, having previously been an arbitrator for the General Agreements on Tariffs and Trade (GATT). Dr. Noronha was also appointed as an arbitrator of the China International Economic and Trade Arbitration Commission (CIETAC), Beijing and Shanghai and also is an Arbitror of the South China International Economic and Trade Arbitration Commission (SCIA), China. He was a member of the International Commission of the Law Society of England and Wales. He was the Brazilian Bar’s chief negotiator for the agreements on the legal professions within MERCOSUL and is the correspondent in Brazil of the publications “International Trade Law and Regulation”, Oxford; “World Markets Research Centre”, London, UK; “Trade Practices Law Journal”, Sydney, Australia; member of the editorial board of the publication “International Trade Reports”, Cambridge UK, President of the UBE and Member of the Board of Trustees of the Padre Anchieta Foundation (TV Cultura). President of the Institute and of the Editorial Council of the Confucius Institute – UNESP. Member of Academy of Letters and Culture of Portugal. Member of Maurício Grabois Foundation. INTRODUÇÃO À REVOLUÇÃO CULTURAL NA REPÚBLICA POPULAR DA CHINA. “BRAZILIAN LAND LAW AND INTERNATIONAL AGRIBUSINESS”. LA CAMPAGNA DELLA FORZA DI SPEDIZIONE BRASILIANA PER LA LIBERAZIONE D’ITALIA. Dr. Noronha is a member of the American Bar Association, Mercosul Association for the Rule of Law in International Relations (Chairman), Associazione Giuristi di Lingua Italiana, Association of Fellows and Legal Scholars of the Centre for International Legal Studies, Vienna, Austria, Union Internationale des Avocats (member of the National Executive Committee), the Latin-American Society of Labour Law and Regional Integration (counsellor), the Florida Bar (Consultant in Brazilian and Portuguese law) and the California Bar(consultant in Brazilian Law). Corporate law; contracts; securities; banking; finance and investments; taxation; the law of international trade; financial criminal law; international public law and conflict of laws; international arbitration and complex multi-disciplinary domestic and international litigation; complex corporate and trade negotiations and mediation. Dr. Noronha is the coordinator of the post-graduation program in Chinese law of Escola Paulista de Direito – EPD, São Paulo, Brasil. Dr. Noronha was the coordinator and a professor of the post-graduation programmes of International Law and International Trade Law of the Escola Paulista de Direito – EPD, São Paulo, Brazil, from 2007 to 2009. He was a professor of International Trade Law at the Graduate School of Universidade Candido Mendes, Rio de Janeiro. Consultant for the North-South Centre at the University of Miami on The Free Trade Area for the Americas. Visiting Fellow at the University of South Africa in 1998. Fellow of the Institute of Advanced Legal Studies of the University of London. Fellow of the Center for International Legal Studies, Vienna, Austria. Post-graduation lecturer of the University of Southern California and Duke University (USA); Wits University, University of South Africa and University of Cape Town (South Africa); Institute of Foreign Trade, Jawaharlal Nehru University and International Management Institute (India); Law School of the Institute of Foreign Trade, Shanghai University and Fudan University (Shanghai, China); Tsinghua Universtity and Central University (Beijing, China); Universidade de Lisboa (Portugal); Universidade Autônoma de Lisboa (Portugal), University 3 de Febrero (Argentina); Federal University, Catholic University of São Paulo, UNESP (University of the State of São Paulo), UFMG (Federal University of the State of Minas Gerais), UFRGS (Federal University of the State of Rio Grande do Sul), FGVRJ (Getulio Vargas Foundation in the State of Rio de Janeiro), UNB and College of Naval War, all of them in Brazil. Dr. Noronha were a columnist for Jornal do Brasil (RJ) since 2001, and the legal site Ultima Instancia, apart from collaborating on various Brazilian and international publications.